On August 22-25, 2012, Dai Bingguo, Chinese State Councilor and top national security advisor to President Hu Jintao, will go to Ulaanbaatar to meet newly installed Mongolian government and Parliamentary leaders. This visit may be a reaction to US Secretary of State Hillary Clinton’s July 9 trip and the 7th annual Khaan Quest joint exercise of the Mongolian Armed forces in partnership with the Alaska National Guard for the US Army Pacific Command (USARPAC), occurring on August 11-23. However, more likely Dai’s timing is governed by a growing crisis in Sino-Mongolian mineral trade and investment. Propelled by a mining boom particularly in the coal sector, Mongolia now is one of the world’s fastest developing economies with a 17-percent growth rate in 2011 that has continued into 2012. China is Mongolia’s number one trade partner, accounting for 93 percent of its exports – mainly in minerals. Mongolia has enjoyed soaring Chinese investment of some $3.7 billion and bilateral trade turnover of $3.3 billion in the first six months of 2012 – a full 21-fold increase over the same period in 2011 (www.infomongolia.com, August 15). However, the Mongolian government and people increasingly view the Sino-Mongolian relationship as threatening to their national sovereignty and are searching for a more balanced foreign and economic development policy. As a result, the Mongols have taken a number of controversial steps to curtail Chinese investment in mineral deposits and diversify Mongolia’s trade partners, which impact on the overall foreign investment climate. Dai’s visit was announced in Ulaanbaatar by the Chinese Ambassador to Mongolia Wang Xiaolong. He enumerated the official objectives for the discussions to be building trust by jointly determining cooperation initiatives, identifying sectors for collaboration, holding extensive talks on specific mining and industrial development projects, and agreeing on a further strengthening of humanitarian and cultural relations. It is certain that Dai will make a last-ditch effort to influence Mongolian authorities to approve the $926 million bid of China’s state-controlled Aluminum Corporation of China (Chalco), which is investing increasingly in coal and iron projects worldwide, to take a 58-percent controlling stake of the Ovoot Tolgoi coal mine, presently owned by SouthGobi Resources Ltd. (www.bloomberg.com, April 2). SouthGobi’s majority stockholder is the Canadian company Ivanhoe Mines, which in early August was renamed Turquoise Hill Resources. Turquoise Hill needs the money from the stock sale to fulfill the contractual terms of its partnership with multinational mining giant Rio Tinto to develop Mongolia’s large copper-gold deposit known as Oyu Tolgoi, located 80 kilometers north of the Sino-Mongolian border. Turquoise Hill claims Oyu Tolgoi holds 41 billion pounds of copper and 21 million ounces of gold in measured resources and an equal amount in inferred resources. Rio Tinto, which controls 51 percent of Oyu Tolgoi, expects to invest $6.2 billion to begin commercial production in 2013, with long-term copper contracts signed with Chinese customers (www.steelguru.com, August 17). When Turquoise Hill announced in April that it would raise funds for its Oyu Tolgoi investment share by selling stock in the Ovoot Tolgoi coal mine to Chalco, the Mongolian Government in response to Parliamentarian criticism across the political spectrum decided to revoke its license for coal production and insisted it must review the legality of the potential sale. A political climate of anti-Chinese sentiment overcame the election season leading up to the June 29 parliamentary elections. Thus, in mid-May, spurred by “resource nationalism” advocated in the name of national security, the Mongolian Parliament passed amendments to the Foreign Investment Law that require a government panel to approve all foreign investment in the mining, finance, media and telecommunications sectors by a state-owned foreign investor or organization regardless of level of ownership. 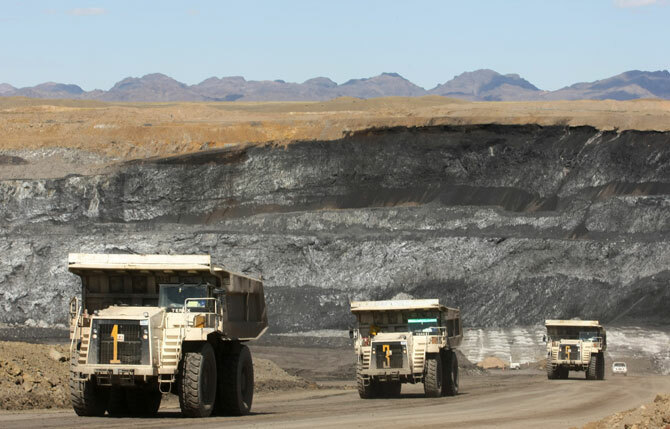 Mongolia also delayed settling the short list of foreign investors in the country’s huge 7.5-billion-ton Tavan Tolgoi coking coal-uranium deposit, and the government has increasingly suggested the project could be handled, albeit more slowly, by a Mongolian state-owned enterprise. Furthermore, a Cabinet decision approved by the Parliament in August created a master plan for a Mongolian industrial development complex in the Gobi Desert steppe city of Sainshand to manufacture value-added refined mineral products under the guidance of Bektel Corporation (english.news.mn, August 8). Chalco originally had given itself until July 4 to complete the Ovoot Tolgoi stock purchase, but has been forced to extend the finalization period twice for negotiations with Mongolian authorities. It is expected that Dai will offer incentives to Mongolia to permit the deal to go forward, but SouthGobi Chief Executive Alex Molyneux was quoted as believing the Mongols had made any Chalco acquisition impossible (Reuters-India, August 14). However, a further card that Dai will carry into his discussions in Ulaanbaatar is that Rio Tinto and Turquoise Hill must conclude a deal to import power from China at least for a few years in order for the big Oyu Tolgoi copper-gold project to begin operations. Although talks have been ongoing for a year, there has been no agreement. The Mongolian government possesses a penchant for spending “advanced tax revenues” from mining operations and has promised to distribute shares and profits from its big state-controlled mineral deposits such as Oyu Tolgoi to its populace. But, together with slowing Chinese coking coal demand, the Mongols’ national security fears regarding China will now have to be reconciled with the potential for very real losses in revenue from foreign investors and mineral exports.